The cast and creators of Monty Python musical Spamalot are hoping to set a new record for the world's largest coconut orchestra. The Guinness World Record attempt will take place in London's Trafalgar Square on St George's Day, 23 April. The public will be given a pair of coconuts to "clip-clop" in time to the Python classic Always Look On The Bright Side of Life. The current record of 1,789 was set in March last year, in New York. The gathering was held outside the Shubert Theatre to celebrate the first anniversary of the Broadway show. The cast of the West End production will be on hand to lead the Trafalgar Square attempt. The event will be followed by a special screening of Monty Python and the Holy Grail in Trafalgar Square, at 1930 BST. 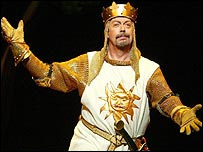 Spamalot recently extended its booking at London's Palace Theatre until 3 November 2007.